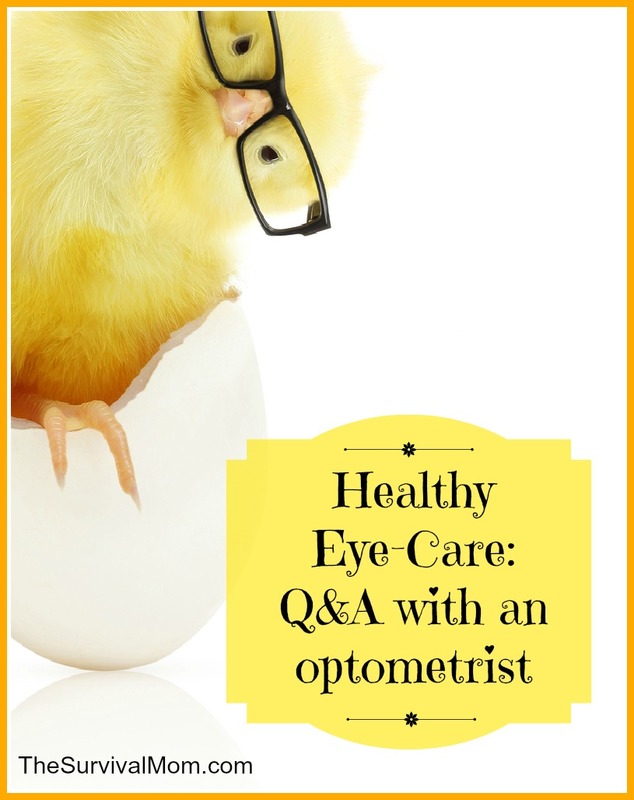 Have you considered the health and optimal function of your eyes? 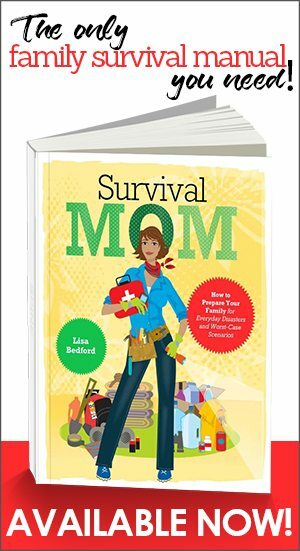 In a survival situation where keeping clean is more difficult (no electricity, no running water, etc. ), eye infections could become more common—especially among children. I don’t want to take any chances with their eyesight. I’m not a doctor, so I asked the best optometrist I know: my sister. Here’s her advice for healthy eye care tips. Q: I have a bottle of eye drops from the last time my kid had pink eye. How long is it good? Can I still use it? Would it be different if I had an unopened bottle? A: All bottled eye drops have an expiration date stamped on the bottle. Unopened bottles should be adequate for up to a year after the expiration date (same for unopened blister packs of contact lenses). If the bottle has been opened, discard after 6 months (regardless of expiration date). When inserting drops, avoid touching the tip of the bottle to skin or eyelashes as it can introduce bacteria into the bottle and cause contamination of the medication. Q: Can pink eye be treated with oral antibiotics, or do I have to keep some drops in my cabinet? A: Pink eye is best treated with antibiotic eye drops, although you could try using orals in a pinch. Pink eye actually tends to be self- limiting (it will go away on its own in time) in non-contact lens wearers, as long as you keep the eye and surrounding area clean, although antibiotics do shorten the course by several days. Apply a warm wet cloth for 5-10 minutes to loosen debris in the lashes, then a gentle scrub of the lids/lashes with baby shampoo 2-3 times daily until the infection resolves. Cleanse from the inner corner of the eye to the outside corner. This keeps debris and bacteria out of the tear drainage ducts which are located at the inner corners of the eyes. Q: Is water really a good enough flush, or do I need to keep that expensive eye wash in my medicine cabinet? Would a bottle of saline be just as good? A: Saline is just as good. I would only use water as a flush if saline is not available. Even in running tap water there are bacteria that are okay for your gut, but not for your eyes. You can increase your risk of a secondary infection with a water flush. Stay away from saline intended for I.V. flushing. The pH is too high in that stuff for the eye. Q: Can I stretch the wear of my contacts longer than the recommended period? If I tried it, what might the consequences be? A: The longer you wear a contact lens, the more deposited they become. More deposits equals more risk of infection or allergic reaction to something on the lens. Also, more deposits reduces oxygen transmission of the lens material, and this can lead to complication from oxygen deprivation to the eye. All three scenarios lead to red, painful eye. In a survival situation probably best to switch to spectacle wear. I put off getting a spare set of glasses because of the expense. Heck, I put off getting a pair with my newest prescription for two years since I spend a good deal on contacts that work well each year! 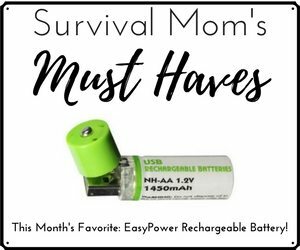 However, having backups are essential as a prepper. So here’s a great website that will let you get a backup pair for each member of the family for pennies on the dollar. I spent about $400 on the perfect pair of glasses a couple of years ago. Last summer I took my newest Rx and bought TWO pairs of glasses for less than $40! EyeBuyDirect* lets you browse your options for frames (I sorted by cheapest, since I didn’t care about fashion and was only buying them as a backup). Once you’ve chosen frames you can enter all the information from your optometrist’s prescription. I didn’t ask for a copy of mine, but all the info I needed was right on the side of each box of contact lenses. Don’t worry if you’re not sure what all the information means or where to find it. The website includes a tutorial on how to read the prescription so you get all the boxes filled in correctly. If you really want the anti-scratch, anti-glare, or other special features you’d get at the doctor’s office, you can request them for a slightly higher cost. As with most online purchases, you must check out with a credit card or Flexible Spending Account card. Voila! Within a week I had two brand new pairs of glasses for 90% less than my last pair. So no more turning your nose up at having an extra pair in your bug-out bag, purse, or glove box. If you have rambunctious kiddos wearing glasses, this option is perfect for lots of reasons. Let’s prepare our families to see the world clearly, and that means healthy eye care! 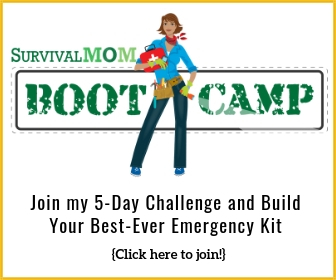 *Neither the author of this article nor the Survival Mom blog are affiliated with EyeBuyDirect. We just think it’s a great resource for budget-friendly eyewear! Great article! LASIK is another option- carefully weigh the benefits vs risks if you are a candidate. I would like to add that, as an optometrist myself, I often see patients who experience headaches and blurred vision with their on-line glasses. And especially for children, whose vision is still developing, it is crucial to have a proper fitting frame and clear vision. Nothing can take the place of an experienced optician who recommends frame shape and style, lens material and design, placement of optical center, not to mention adjustment of frames to your face. (and the contact lens Rx is very often different than the spectacle Rx) If price is of the most importance, or you plan to store the glasses in your BOB and (hopefully) never wear them, then on-line glasses may be ok for you. But remember, as with anything else, you get what you pay for. Please tell me that you are not advocating that people buy glasses online!!! I work in optical and we have never, I repeat NEVER had a patient Rx verification call from one of these places. They will fill whatever Rx you give them and by the same token we have NEVER seen one of these pair of glasses made correctly. Websites come and go. Are the lenses made in the US following proper safety standards? With an impact will you end up with a shattered lens that will cut or take out your eye? Will that website still be there for liability? Since they can’t take measurements on you over the Internet – how do you know if your lenses have the optical center of the lens directly over your pupil or are they harming your eyes by inducing prism? By the way, taking your Rx off of the side of your contact lens box had me slapping my forehead!! It is usually not the same Rx as your eyeglasses because your contacts are worn directly on the eye and it can mask some astigmatism. Also contacts are not usually made in all axis so your eyeglass Rx may be quite different. Bet they made those glasses to the Rx you gave them and didn’t even check with your Dr to find out if that was even your Rx! Typical! Now that you know your glasses were probably made wrong, what is your opinion? I maintain that having a less-than-perfect pair in case of emergency is preferable to having nothing because I can’t afford to shell out $400. While l respect your right to disagree–especially considering your “work in optical”, please remember that this option was offered as a solution for those interested in a “backup pair” of glasses. If my kid breaks his glasses on vacation, having a second pair from an online vendor feels much less dangerous than letting him fly blind for as many weeks as it takes to get home and get a new prescription–and that’s assuming I could afford to replace them right away. Remember, many of us are preparing for more serious, even long-term emergencies where buying new glasses isn’t even an option. Again, an online pair is better than nothing. Mail order companies can deliver the same quality of contact lenses and eyeglasses as one would get through an optometrist. The statement that it’s against US prescription law to get your glasses/contacts this way is completely wrong! I don’t have to “check them out” after you stated that you put in your contact Rx and they filled it – thus violating US prescription laws. That makes them beyond “shady”. It’s not personal. It’s just irritating as all get out to read something like this from a clueless individual advocating for others to take a risk harming their eyes. The online business cannot measure your eyes, therefore cannot tell what measurement to use to position the optical center of the lens. The price indicates very poor quality lenses. Do what you want to with the health of your own family, just don’t advocate this poor judgment to others. 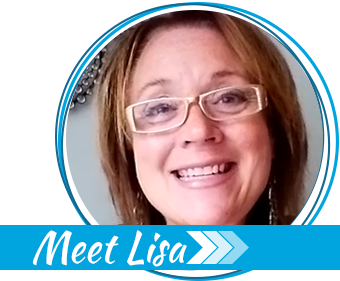 Lisa I didn’t say that buying online was illegal, I said that filling a prescription without verifying it was illegal. Contact lens companies verify each order. I have never had on online eyeglass retailer verify an Rx. That’s why she was able to get glasses with her contact Rx instead of her eyeglass Rx. This seems just weird to me. I am a contact lens wearer, almost totally blind without. And every time I go in for a check, when I get my contact lenses , I get a ‘prescription” for glasses. I can use that online, and I do, because I AM NOT paying $400 for prescription glasses at that Opt doc. I prefer contacts and ONLY use my glasses for backup or SHTF. I have recently gotten pink eye and I found some old eye drops in my medicine cabinet. I was unsure whether they were safe to use and have not used them for fear that they might make my eyes worse. Thank you for the information on expired eye drops, it was the perfect answer to my question. I have been at a loss as to what to do and haven’t found the time to visit a doctor yet. Thank you again! Great! I’m so glad you found this article! Great advice here and I really like the Q and A layout! I really liked the part where you talked about contacts. I’ve noticed that there are a lot of people out there who wear them much longer than they should. Come to think of it, I should see about changing mine out. Like you said, the longer you wear the lens, the more deposited they will become which they will then be more prone to infections.